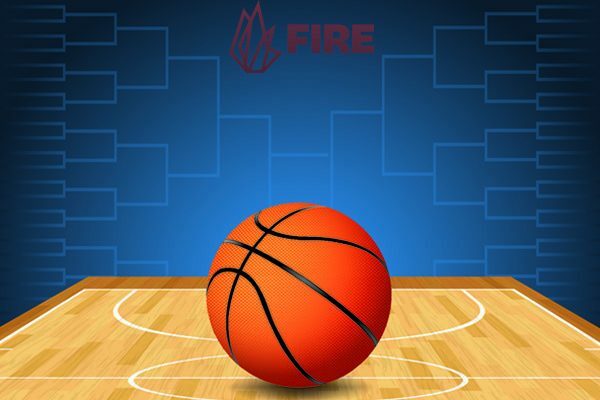 The 2019 NCAA Men’s Basketball Tournament is upon us, and while most have already turned in their brackets, FIRE would like to give our unique perspective on the tournament. As you may know, FIRE rates the speech policies at over 350 public 4-year institutions and over 100 of the most prestigious private colleges and universities. Based on their policies, we assign schools one of three speech code ratings. “Green light” institutions, of which there are currently 49, maintain no policies that infringe on students’ freedom of expression. “Yellow light” schools, of which there are 282, have at least one policy that by virtue of vague wording could too easily be applied to restrict protected expression. “Red light” schools, of which there are 129, have at least one policy that clearly and substantially restricts free expression. There is an additional “warning school” category for the eight private schools or military academies that clearly and consistently place other values above free speech. You can use our search tool to see how your school stacks up. To have a little bit of fun this year, we took a look at the March Madness bracket to see how those universities fared in terms of their free speech record. And maybe this year, when you’re deciding who to cheer for, cheer for the school that protects its students’ freedom of speech! The East Region is anchored by green light school Duke University as the one seed. Duke is joined by fellow green light institutions North Carolina Central University, Mississippi State University, and the University of Maryland. On the opposite end of the spectrum are red light school Louisiana State University and frequent free speech opponent Liberty University, which, while unrated by FIRE, made our list of the 10 Worst Colleges for Free Speech this year. Apologies to green light schools Arizona State University and University of Florida, as they are in bad company in the West Region, where more than half of the red light institutions in the tournament reside. The red lights in the West Region include Syracuse University (which also made our 10 Worst list this year), Marquette University, Murray State University, Florida State University, Northern Kentucky University, the University of Michigan, and the University of Montana. All of this makes for the worst region for free expression this year. On the other hand, the South Region might be the best region for free speech this year. It has the most green light universities, at five (the University of Virginia as the one seed, the University of Mississippi, Kansas State University, Purdue University, and the University of Tennessee), the fewest yellow lights at six, and only a single red light, in Colgate University. Additionally, it’s the only region without a school that directly made our 10 Worst List (although the University of Wisconsin – Madison is part of the University of Wisconsin system, which made the list due to the illiberal actions of the system president.) Good luck especially to the teams of the South Region! Finally, the Midwest Region is anchored by one seed and green light school University of North Carolina – Chapel Hill, which is joined by fellow green light school Auburn University. Unfortunately, they are joined by three red light institutions, in Utah State University, Northeastern University, and the University of Houston, and the yellow light University of Kansas, which made our 10 Worst List. Of the 68 colleges and universities in the tournament, 13 of them are green light institutions. Surprisingly, they outnumber the 12 red light institutions in the tournament. Unsurprisingly, yellow light institutions are most numerous, with 27 represented in the tournament. There are two warning schools, and the remaining 14 schools are unrated by FIRE. Not only are green light schools statistically overrepresented in the tournament, they bear the best average seeding, at 5.6, compared to 8.8 for yellow light schools, and 8.5 for red light schools. 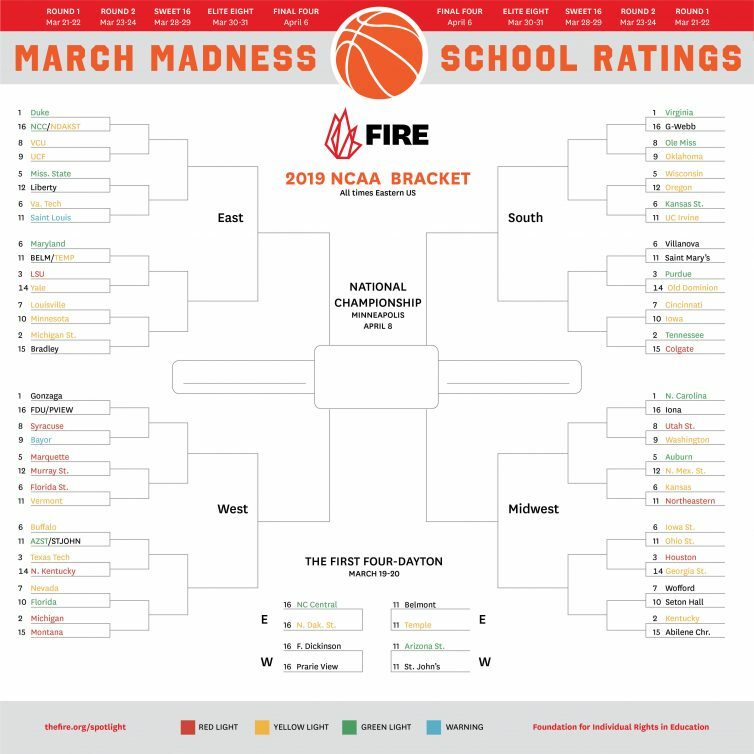 Most interestingly, three of the four one seeds are green light schools, while the fourth is unrated by FIRE. Now, we would never say anything as ridiculous as “Improving your speech policies will make your school better at sports”… but it certainly can’t hurt. And also, improving your speech codes will definitely make your school better at sports. Please improve your speech codes!